Ever played around with colors in excel? You might feel the weirdness in it, but why not give it a try when you have a chance to do so. Play, Fill, Pattern around the space using Colors from the Palette !!! The key reason behind writing this blog is to provide a practical example of using Relative Referencing in Excel VBA. However the blog covers many other things as well, not just the Relative Referencing concept . First, let's see how the tool works ! Insert Color Filled Rectangular Boxes of your choice and assign a Macro to each of them and also a number which can be stored in a particular cell. So each time a color filled button is clicked, the Macro gets executed and also the number that is assigned to the button gets stored on to a particular cell linked. I have built a Macro for the same wherein it fetches the reference value from the cell that is linked to the Color filled Button and executes it accordingly. In the above macro, the Cell "AB1" has been assigned to this particular color box and number 1 has been assigned and stored. The Drawing Board or the Pattern Filling Workspace has been defined in such a way that all the patterns are restricted within the outlined rectangle. For that, the "Not Intersect" functionality has been used. It's as cool as ice but it doesn't melt. The bold and pink highlighted part of the above macro would restrict the painting within the defined drawing board. This line has been added in all the pattern macros. This is an "Erase-a-Cell" button which erases the active / selected cell/range. Its scope has also been defined using again the "Not Intersect" Functionality as elaborated above. The Reset Button clears the drawing board as a whole on one click. In the code, mentioned below, I have just filled the entire drawing board area with White Color but not cleared it using Clear/ Clearcontents options. The reason, why I haven't used the later, is because Clearcontents clears any cell content but not the format, while the Clear option clears the entire format including the outline marked. Fill-a-Cell button fills in the active cell corresponding to the colour chosen from the Color Palette. Various button have been designed with varied Offset function fused with Relative Referencing. The Offset function works in relative reference of the active cell in terms of the shift of the rows & columns. For example an offset of (1,-2) would signify that from the active cell position it would move one Row down and two Columns to the Left. This concludes the descriptive part of the Paint Board. I would like all of you to go through the same and come up with any query or suggestion for the improvement in the board. Also if there are any such fun filled stuff which can be created using Excel / VBA please do feel free to reach out. 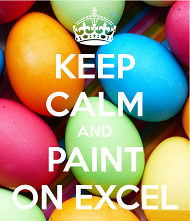 We welcome all the excel freaks to be part of this family. may you come out with flying colours every time !